This is so much tastier than it looks. I promise. 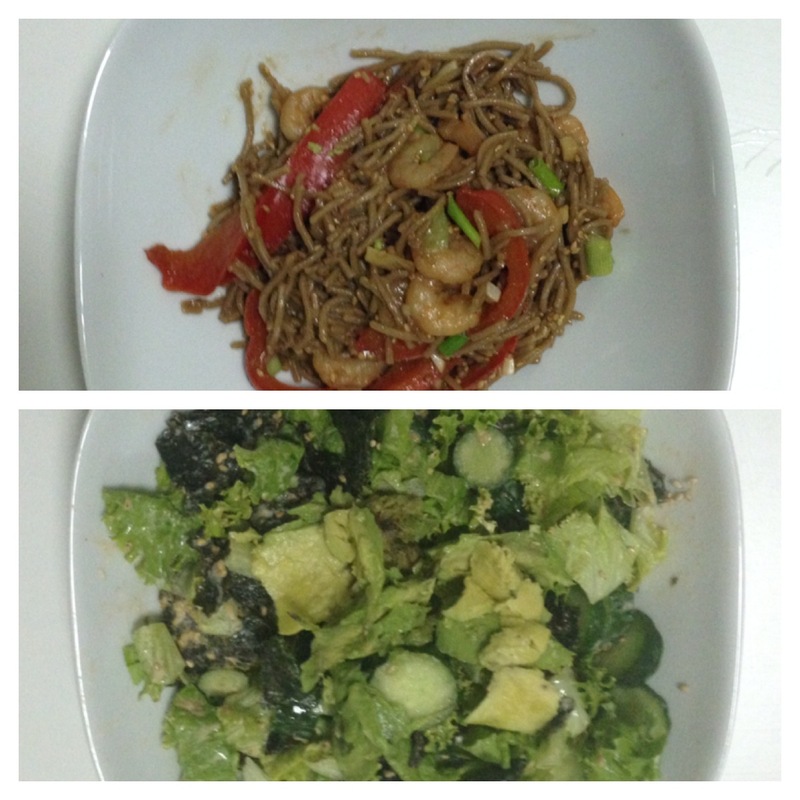 This week’s Recipe Challenge was making two Japanese inspired recipes that fit nicely into my protein/carb/salad dinners. I found both recipes from A Beautiful Mess – a blog which is ANYTHING but – but somehow manages to be even more charming because of its name. Cook soba noodles in boiling water for 5 minutes. Drain and set aside. Slice up the red pepper. Cook with a tablespoon of olive oil just until the peppers start to soften. Then, add the cooked shrimp and noodles to the pan and turn the heat down to low. In a bowl mix the honey, soy sauce, rice vinegar, sesame oil, ginger, red pepper flakes and minced garlic. Pour over the noodles, shrimp, and peppers. Cook for 5 to 6 minutes until the liquid has reduced some. Sprinkle with sesame seeds and green onions. In the bottom of the bowl you plan to eat your salad in mix the lemon juice, mayo, chili sauce and wasabi sauce. Chop and wash the lettuce and put it into the original bowl along with 1 or 2 seaweed sheets.